778 total comments in 651 stories. SFXT Special Edition and Release date Announced! 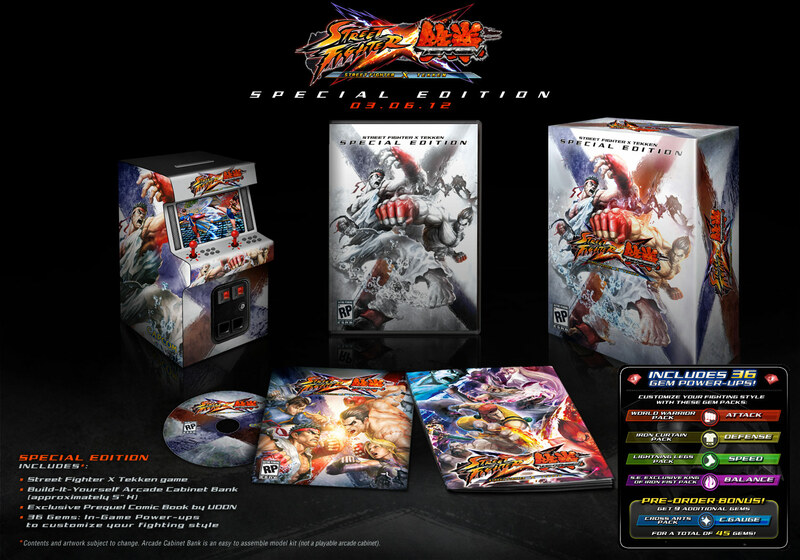 Special Edition Announced for SFXT and it looks pretty cool! The special edition for SFXT has been revealed. The special edition includes: SFXT game, a "Build-It-Yourself" Arcade Cabinet Bank, Exclusive Prequel Comic Book by UDON, 36 Gems: Includes All Pre-Order Packs Plus An Exclusive Pack, and 9 Exclusive Gems with pre-order! Yet another reason to be hype for this AWESOME game. I will get the SE no doubt i have been looking forward to this game for so long and was hoping it would have a SE. At NYCC '11 producer Ono confirmed the release dates for SFXT it will be released March 6th, 2012 in North America and March 9th in Europe. What do you guys think of this let us know and dont be a jimmy. Take a look at the achievements for UMVC3! The Ultimate 50 Unlock all achievements. Waiting for the Trade 50 View all endings in Arcade mode. The Best There Is 10 Beat Arcade mode on the hardest difficulty.
. The Points Do Matter 20 Earn 400,000 points in Arcade mode. High-Score Hero 30 Earn 500,000 points in Arcade mode.
. Up To The Challenge 30 Clear 240 missions in Mission mode. Master of Tasks 40 Clear 480 missions in Mission mode. Training Montage 20 Play in Offline Mode for over 5 hours. Training in Isolation 30 Play in Offline Mode for over 30 hours. Seductive Embrace 20 Play on Xbox LIVE for over 5 hours. Rivals Welcome 30 Play on Xbox LIVE for over 30 hours. Brave New World 10 Participate in any mode over Xbox LIVE. Hellbent 20 Participate in 100 matches in Xbox LIVE. Dreaded Opponent 20 Participate in 200 matches in Xbox LIVE. Forged From Steel 30 Participate in 300 matches in Xbox LIVE.
. Incredible 20 Win without calling your partners or switching out in a Xbox LIVE match. Need a Healing Factor 20 Win without blocking in an Xbox LIVE match. Crazy Good 10 Surpass the rank of Fighter. Mega Good 40 Surpass the 6th rank of any class. Hotshot 15 Win 10 battles in Ranked Match. Slam Master 20 Win 50 battles in Ranked Match. Fighting Machine 40 Win 100 battles in Ranked Match. Noble Effort 15 Get a 5-game win streak in Ranked Match. Assemble! 15 Participate in an 8 player Lobby over Xbox LIVE. Dominator 30 Collect 100 titles. A Warrior Born 10 Earn 5,000 Player Points (PP).
. Divine Brawler 50 Earn 100,000 Player Points (PP). Comic Collector 50 Unlock all items in the Gallery. Passport to Beatdown Country 10 Fight in all of the stages. these achievements seem pretty average like the first MVC3 i got 1000/1000 from the first one and it seems like this will be another easy 1000 im glad we get to see some pics of the characters yet to be shown in game. This game is gonna PWN let us know what you think and dont be a jimmy! A great video showing off four new characters in action! This video is pretty awesome it explains how to do some of the unique game mechanics. It also confirms hugo, ibuki, kuma and raven all are a welcome addition to the cast. Let me start off by saying hugo is HUGE damn and ibuki looks like her SSF4 self while kuma and raven look interesting. This video is full of hype and that's exactly what i am i can't wait for this game to drop. Let us know what you think and don't be a jimmy. 2 new warriors have stepped in the SFxT ring! 2 more teaser trailers for street fighter X tekken. Two more trailers were revealed recently showing two more characters for street fighter X tekken. To my surprise these two are extremely obvious the first one is kuma from tekken and the second is ibuki from street fighter. I have never like kuma and ibuki is cool but i was hoping for a brand new character not a recycled SSF4 character. The roster is filling out nicely and im still holding on to hope for alex from street fighter 3 i think he would pwn in this game lol. Let us know what you think and don't be a jimmy.